Phenotypic plasticity can be defined as the ability of one genotype to produce more than one phenotype when exposed to different environments. Phenotypic plasticity is the ability of an organism to change its phenotype in response to changes in the environment. Fundamental to the way in which organisms cope with environmental variation, phenotypic plasticity encompasses all types of environmentally induced changes (e.g. morphological, physiological, behavioural, phenological) that may or may not be permanent throughout an individual’s lifespan. The term was originally used to describe developmental effects on morphological characters, but is now more broadly used to describe all phenotypic responses to environmental change, such as acclimation or acclimatization, as well as learning. The special case when differences in environment induce discrete phenotypes is termed polyphenism. In many cases of phenotypic plasticity, changes in environmental conditions (e.g. temperature) cause different genes to be expressed in organisms. Generally, phenotypic plasticity is more important for immobile organisms (e.g. plants) than mobile organisms (e.g. most animals), as mobile organisms can often move away from unfavourable environments. Nevertheless, mobile organisms also have at least some degree of plasticity in at least some aspects of the phenotype. One mobile organism with substantial phenotypic plasticity is Acyrthosiphon pisum of the Aphid family, which exhibits the ability to interchange between asexual and sexual reproduction, as well as growing wings between generations when plants become too populated. Phenotypic plasticity in plants includes the allocation of more resources to the roots in soils that contain low concentrations of nutrients and the alteration of leaf size and thickness. Dandelion are well known for exhibiting considerable plasticity in form when growing in sunny versus shaded environments. The transport proteins present in roots are also changed depending on the concentration of the nutrient and the salinity of the soil. Some plants, Mesembryanthemum crystallinum for example, are able to alter their photosynthetic pathways to use less water when they become water- or salt-stressed. The developmental effects of nutrition and temperature have been demonstrated. Within the Gray wolf (Canis lupus), the dog demonstrates wide phenotypic plasticity. Additionally, the Speckled Wood butterfly, the males of this species have two morphs. One with three dots on its hind wing, and one with four dots on its hind wings. The development of the fourth dot is dependent on environmental conditions, more specifically location, and the time of year. In amphibians, as of 2015, Pristimantis mutabilis is known to show a remarkable phenotypic plasticity. Another example, is the Southern Rockhopper Penguin. Rockhopper penguins are present at a variety of climates and locations; Amsterdam Island's subtropical waters,Kerguelen Archipelago's subarctic coastal waters, and Crozet Archipelago's subantarctic coastal waters. Due to the species plasticity they are able to express different strategies and foraging behaviors depending on the climate and environment. A main factor that has influenced the species' behavior is where food is located. Plastic responses to temperature are essential among ectothermic organisms, as all aspects of their physiology are directly dependent on their thermal environment. As such, thermal acclimation entails phenotypic adjustments that are found commonly across taxa, such as changes in the lipid composition of cell membranes. Temperature change influences the fluidity of cell membranes by affecting the motion of the fatty acyl chains of glycerophospholipids. Because maintaining membrane fluidity is critical for cell function, ectotherms adjust the phospholipid composition of their cell membranes such that the strength of van der Waals forces within the membrane is changed, thereby maintaining fluidity across temperatures. Phenotypic plasticity of the digestive system allows some animals to respond to changes in dietary nutrient composition, diet quality, and energy requirements. Changes in the nutrient composition of the diet (the proportion of lipids, proteins and carbohydrates) may occur during development (e.g. weaning) or with seasonal changes in the abundance of different food types. These diet changes can elicit plasticity in the activity of particular digestive enzymes on the brush border of the small intestine. For example, in the first few days after hatching, nestling house sparrows (Passer domesticus) transition from an insect diet, high in protein and lipids, to a seed based diet that contains mostly carbohydrates; this diet change is accompanied by two-fold increase in the activity of the enzyme maltase, which digests carbohydrates. Acclimatizing animals to high protein diets can increase the activity of aminopeptidase-N, which digests proteins. Poor quality diets (those that contain a large amount of non-digestible material) have lower concentrations of nutrients, so animals must process a greater total volume of poor-quality food to extract the same amount of energy as they would from a high-quality diet. Many species respond to poor quality diets by increasing their food intake, enlarging digestive organs, and increasing the capacity of the digestive tract (e.g. prairie voles, Mongolian gerbils, Japanese quail, wood ducks, mallards). Poor quality diets also result in lower concentrations of nutrients in the lumen of the intestine, which can cause a decrease in the activity of several digestive enzymes. Animals often consume more food during periods of high energy demand (e.g. lactation or cold exposure in endotherms), this is facilitated by an increase in digestive organ size and capacity, which is similar to the phenotype produced by poor quality diets. During lactation, degus (Octodon degus) increase the mass of their liver, small intestine, large intestine and cecum by 15-35%. Increases in food intake do not cause changes in the activity of digestive enzymes because nutrient concentrations in the intestinal lumen are determined by food quality and remain unaffected. Intermittent feeding also represents a temporal increase in food intake and can induce dramatic changes in the size of the gut; the Burmese python (Python molurus bivittatus) can triple the size of its small intestine just a few days after feeding. AMY2B (Alpha-Amylase 2B) is a gene that codes a protein that assists with the first step in the digestion of dietary starch and glycogen. An expansion of this gene in dogs would enable early dogs to exploit a starch-rich diet as they fed on refuse from agriculture. Data indicated that the wolves and dingo had just two copies of the gene and the Siberian Husky that is associated with hunter-gatherers had just three or four copies, whereas the Saluki that is associated with the Fertile Crescent where agriculture originated had 29 copies. The results show that on average, modern dogs have a high copy number of the gene, whereas wolves and dingoes do not. The high copy number of AMY2B variants likely already existed as a standing variation in early domestic dogs, but expanded more recently with the development of large agriculturally based civilizations. Infection with parasites can induce phenotypic plasticity as a means to compensate for the detrimental effects caused by parasitism. Commonly, invertebrates respond to parasitic castration or increased parasite virulence with fecundity compensation in order to increase their reproductive output, or fitness. For example, water fleas (Daphnia magna), exposed to microsporidian parasites produce more offspring in the early stages of exposure to compensate for future loss of reproductive success. A reduction in fecundity may also occur as a means of re-directing nutrients to an immune response, or to increase longevity of the host. This particular form of plasticity has been shown in certain cases to be mediated by host-derived molecules (e.g. schistosomin in snails Lymnaea stagnalis infected with trematodes Trichobilharzia ocellata) that interfere with the action of reproductive hormones on their target organs. Changes in reproductive effort during infection is also thought to be a less costly alternative to mounting resistance or defence against invading parasites, although it can occur in concert with a defence response. Hosts can also respond to parasitism through plasticity in physiology aside from reproduction. House mice infected with intestinal nematodes experience decreased rates of glucose transport in the intestine. To compensate for this, mice increase the total mass of mucosal cells, cells responsible for glucose transport, in the intestine. This allows infected mice to maintain the same capacity for glucose uptake and body size as uninfected mice. Phenotypic plasticity can also be observed as changes in behaviour. In response to infection, both vertebrates and invertebrates practice self-medication, which can be considered a form of adaptive plasticity. Various species of non-human primates infected with intestinal worms engage in leaf-swallowing, in which they ingest rough, whole leaves that physically dislodge parasites from the intestine. Additionally, the leaves irritate the gastric mucosa, which promotes the secretion of gastric acid and increases gut motility, effectively flushing parasites from the system. The term "self-induced adaptive plasticity" has been used to describe situations in which a behavior under selection causes changes in subordinate traits that in turn enhance the ability of the organism to perform the behavior. For example, birds that engage in altitudinal migration might make "trial runs" lasting a few hours that would induce physiological changes that would improve their ability to function at high altitude. Woolly bear caterpillars (Grammia incorrupta) infected with tachinid flies increase their survival by ingesting plants containing toxins known as pyrrolizidine alkaloids. The physiological basis for this change in behaviour is unknown; however, it is possible that, when activated, the immune system sends signals to the taste system that trigger plasticity in feeding responses during infection. Plasticity is usually thought to be an evolutionary adaptation to environmental variation that is reasonably predictable and occurs within the lifespan of an individual organism, as it allows individuals to ‘fit’ their phenotype to different environments. 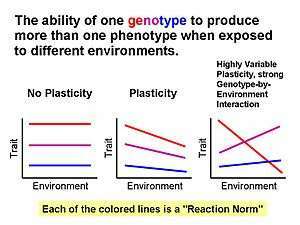 If the optimal phenotype in a given environment changes with environmental conditions, then the ability of individuals to express different traits should be advantageous and thus selected for. Hence, phenotypic plasticity can evolve if Darwinian fitness is increased by changing phenotype. However, the fitness benefits of plasticity can be limited by the energetic costs of plastic responses (e.g. synthesizing new proteins, adjusting expression ratio of isozyme variants, maintaining sensory machinery to detect changes) as well as the predictability and reliability of environmental cues (see Beneficial acclimation hypothesis). Freshwater snails (Physa virgata), provide an example of when phenotypic plasticity can be either adaptive or maladaptive. In the presence of a predator, bluegill sunfish, these snails make their shell shape more rotund and reduce growth. This makes them more crush-resistant and better protected from predation. However, these snails cannot tell the difference in chemical cues between the predatory and non-predatory sunfish. Thus, the snails respond inappropriately to non-predatory sunfish by producing an altered shell shape and reducing growth. These changes, in the absence of a predator, make the snails susceptible to other predators and limit fecundity. Therefore, these freshwater snails produce either an adaptive or maladaptive response to the environmental cue depending on whether the predatory sunfish is actually present. Given the profound ecological importance of temperature and its predictable variability over large spatial and temporal scales, adaptation to thermal variation has been hypothesized to be a key mechanism dictating the capacity of organisms for phenotypic plasticity. The magnitude of thermal variation is thought to be directly proportional to plastic capacity, such that species that have evolved in the warm, constant climate of the tropics have a lower capacity for plasticity compared to those living in variable temperate habitats. Termed the “climatic variability hypothesis”, this idea has been supported by several studies of plastic capacity across latitude in both plants and animals. However, recent studies of Drosophila species have failed to detect a clear pattern of plasticity over latitudinal gradients, suggesting this hypothesis may not hold true across all taxa or for all traits. Some researchers propose that direct measures of environmental variability, using factors such as precipitation, are better predictors of phenotypic plasticity than latitude alone. Selection experiments and experimental evolution approaches have shown that plasticity is a trait that can evolve when under direct selection and also as a correlated response to selection on the average values of particular traits. Unprecedented rates of climate change are predicted to occur over the next 100 years as a result of human activity. Phenotypic plasticity is a key mechanism with which organisms can cope with a changing climate, as it allows individuals to respond to change within their lifetime. This is thought to be particularly important for species with long generation times, as evolutionary responses via natural selection may not produce change fast enough to mitigate the effects of a warmer climate. The North American Red Squirrel (Tamiasciurus hudsonicus) has experienced an increase in average temperature over this last decade of almost 2 °C. This increase in temperature has caused an increase in abundance of white spruce cones, the main food source for winter and spring reproduction. In response, the mean lifetime parturition date of this species has advanced by 18 days. Food abundance showed a significant effect on the breeding date with individual females, indicating a high amount of phenotypic plasticity in this trait. ↑ Price, Trevor D.; Qvarnström, Anna; Irwin, Darren E. (2003). "The role of phenotypic plasticity in driving genetic evolution". Proceedings of the Royal Society B: Biological Sciences. 270 (1523): 1433–40. doi:10.1098/rspb.2003.2372. PMC 1691402 . PMID 12965006. ↑ Kelly, Scott A.; Panhuis, Tami M.; Stoehr, Andrew M. (2012). "Phenotypic Plasticity: Molecular Mechanisms and Adaptive Significance". Comprehensive Physiology. pp. 1417–39. doi:10.1002/cphy.c110008. ISBN 978-0-470-65071-4. ↑ Schlichting, C D (1986). "The Evolution of Phenotypic Plasticity in Plants". Annual Review of Ecology and Systematics. 17: 667–93. doi:10.1146/annurev.es.17.110186.003315. ↑ International Aphid Genomics Consortium (2010). Eisen, Jonathan A, ed. "Genome Sequence of the Pea Aphid Acyrthosiphon pisum". PLoS Biology. 8 (2): e1000313. doi:10.1371/journal.pbio.1000313. PMC 2826372 . PMID 20186266. ↑ Sultan, Sonia E (2000). "Phenotypic plasticity for plant development, function and life history". Trends in Plant Science. 5 (12): 537–42. doi:10.1016/S1360-1385(00)01797-0. PMID 11120476. ↑ Alemán, Fernando; Nieves-Cordones, Manuel; Martínez, Vicente; Rubio, Francisco (2009). "Differential regulation of the HAK5 genes encoding the high-affinity K+ transporters of Thellungiella halophila and Arabidopsis thaliana". Environmental and Experimental Botany. 65 (2–3): 263–9. doi:10.1016/j.envexpbot.2008.09.011. ↑ Tallman, Gary; Zhu, Jianxin; Mawson, Bruce T.; Amodeo, Gabriella; Nouhi, Zepedeh; Levy, Kathleen; Zeiger, Eduardo (1997). "Induction of CAM in Mesembryanthemum crystallinum Abolishes the Stomatal Response to Blue Light and Light-Dependent Zeaxanthin Formation in Guard Cell Chloroplasts". Plant and Cell Physiology. 38 (3): 236–42. doi:10.1093/oxfordjournals.pcp.a029158. ↑ Weaver, Morris E.; Ingram, Douglas L. (1969). "Morphological Changes in Swine Associated with Environmental Temperature". Ecology. 50 (4): 710–3. doi:10.2307/1936264. JSTOR 1936264. ↑ Ostrander, E. A.; Wayne, R. K. (2005). "The canine genome". Genome Research. 15 (12): 1706–16. doi:10.1101/gr.3736605. PMID 16339369. ↑ Shreeve, T.G. (1987). "The mate location behaviour of the male speckled wood butterfly, Pararge aegeria, and the effect of phenotypic differences in hind-wing spotting". Animal Behavior. 35: 682–690. doi:10.1016/s0003-3472(87)80104-5. ↑ Guayasamin, Juan; Krynak, Tim; Krynak, Katherine; Culebras, Jaime; Hutter, Carl (2015). "Phenotypic plasticity raises questions for taxonomically important traits: a remarkable new Andean rainfrog (Pristimantis) with the ability to change skin texture". Zoological Journal of the Linnean Society. 173 (4): 913–928. doi:10.1111/zoj.12222. 1 2 3 4 Tremblay, Yann (2003). "Geographic variation in the foraging behaviour, diet and chick growth of rockhopper penguins" (PDF). Marine Ecology. ↑ Hazel, Jeffrey R. (1995). "Thermal Adaptation in Biological Membranes: Is Homeoviscous Adaptation the Explanation?". Annual Review of Physiology. 57: 19–42. doi:10.1146/annurev.ph.57.030195.000315. PMID 7778864. 1 2 Brzek, P.; Kohl, K.; Caviedes-Vidal, E.; Karasov, W. H. (2009). "Developmental adjustments of house sparrow (Passer domesticus) nestlings to diet composition". Journal of Experimental Biology. 212 (9): 1284–93. doi:10.1242/jeb.023911. PMID 19376949. 1 2 Cortés, Pablo A.; Franco, Marcela; Sabat, Pablo; Quijano, Silvia A.; Nespolo, Roberto F. (2011). "Bioenergetics and intestinal phenotypic flexibility in the microbiotherid marsupial (Dromiciops gliroides) from the temperate forest in South America". Comparative Biochemistry and Physiology A. 160 (2): 117–24. doi:10.1016/j.cbpa.2011.05.014. PMID 21627996. 1 2 J.M. Starck (1999-11-15). "Phenotypic flexibility of the avian gizzard: Rapid, reversible and repeated changes of organ size in response to changes in dietary fibre content". Journal of Experimental Biology. 202 (22): 3171–9. PMID 10539966. 1 2 3 Liu, Quan-Sheng; Wang, De-Hua (2007). "Effects of diet quality on phenotypic flexibility of organ size and digestive function in Mongolian gerbils (Meriones unguiculatus)". Journal of Comparative Physiology B. 177 (5): 509–518. doi:10.1007/s00360-007-0149-4. 1 2 3 Naya, Daniel E.; Ebensperger, Luis A.; Sabat, Pablo; Bozinovic, Francisco (2008). "Digestive and Metabolic Flexibility Allows Female Degus to Cope with Lactation Costs". Physiological and Biochemical Zoology. 81 (2): 186–94. doi:10.1086/527453. PMID 18190284. ↑ Krockenberger, A. K.; Hume, I. D. (2007). "A flexible digestive strategy accommodates the nutritional demands of reproduction in a free-living folivore, the Koala (Phascolarctos cinereus)". Functional Ecology. 21 (4): 748–756. doi:10.1111/j.1365-2435.2007.01279.x. 1 2 Hammond, Kimberly A.; Wunder, Bruce A. (1991). "The Role of Diet Quality and Energy Need in the Nutritional Ecology of a Small Herbivore, Microtus ochrogaster". Physiological Zoology. 64 (2): 541–67. JSTOR 30158190. ↑ Sabat, Pablo; Riveros, Jose Miguel; López-Pinto, Carlos (2005). "Phenotypic flexibility in the intestinal enzymes of the African clawed frog Xenopus laevis". Comparative Biochemistry and Physiology A. 140 (1): 135–9. doi:10.1016/j.cbpb.2004.11.010. PMID 15664322. ↑ Drobney, Ronald D. (1984). "Effect of Diet on Visceral Morphology of Breeding Wood Ducks". The Auk. 101 (1): 93–8. JSTOR 4086226. ↑ Kehoe, F. Patrick; Ankney, C. Davison; Alisauskas, Ray T. (1988). "Effects of dietary fiber and diet diversity on digestive organs of captive Mallards (Anas platyrhynchos)". Canadian Journal of Zoology. 66 (7): 1597–602. doi:10.1139/z88-233. ↑ Starck, J. Matthias; Beese, Kathleen (2001-01-15). "Structural flexibility of the intestine of Burmese python in response to feeding". The Journal of Experimental Biology. 204 (2): 325–35. PMID 11136618. ↑ Freedman, A. (2014). "Genome sequencing highlights the dynamic early history of dogs". PLOS Genetics. 10 (1): e1004016. doi:10.1371/journal.pgen.1004016. PMC 3894170 . PMID 24453982. ↑ Chadwick, W.; Little, T. J (2005). "A parasite-mediated life-history shift in Daphnia magna". Proceedings of the Royal Society B: Biological Sciences. 272 (1562): 505–9. doi:10.1098/rspb.2004.2959. PMC 1578704 . PMID 15799946. ↑ Ahmed, A. M.; Baggott, S. L.; Maingon, R.; Hurd, H. (2002). "The costs of mounting an immune response are reflected in the reproductive fitness of the mosquito Anopheles gambiae". Oikos. 97 (3): 371–377. doi:10.1034/j.1600-0706.2002.970307.x. ↑ Hurd, Hilary (2001). "Host fecundity reduction: A strategy for damage limitation?". Trends in Parasitology. 17 (8): 363–8. doi:10.1016/S1471-4922(01)01927-4. PMID 11685895. ↑ Schallig, H. D. F. H.; Hordijk, P. L.; Oosthoek, P. W.; Jong-Brink, M. (1991). "Schistosomin, a peptide present in the haemolymph of Lymnaea stagnal is infected with Trichobilharzia ocellata, is produced only in the snail's central nervous system". Parasitology Research. 77 (2): 152–6. doi:10.1007/BF00935429. ↑ Forbes, Mark R. L. (1993). "Parasitism and Host Reproductive Effort". Oikos. 67 (3): 444–50. doi:10.2307/3545356. JSTOR 3545356. ↑ Kristan, Deborah M.; Hammond, Kimberly A. (2003). "Physiological and morphological responses to simultaneous cold exposure and parasite infection by wild-derived house mice". Functional Ecology. 17 (4): 464–471. doi:10.1046/j.1365-2435.2003.00751.x. JSTOR 3598983. 1 2 Singer, Michael S.; Mace, Kevi C.; Bernays, Elizabeth A. (2009). May, Robin Charles, ed. "Self-Medication as Adaptive Plasticity: Increased Ingestion of Plant Toxins by Parasitized Caterpillars". PLoS ONE. 4 (3): e4796. doi:10.1371/journal.pone.0004796. PMC 2652102 . PMID 19274098. ↑ Huffman, Michael A. (2001). "Self-Medicative Behavior in the African Great Apes: An Evolutionary Perspective into the Origins of Human Traditional Medicine". BioScience. 51 (8): 651–61. doi:10.1641/0006-3568(2001)051[0651:SMBITA]2.0.CO;2. 1 2 Swallow, John G.; Rhodes, Justin S.; Garland, Theodore (2005). "Phenotypic and Evolutionary Plasticity of Organ Masses in Response to Voluntary Exercise in House Mice". Integrative and Comparative Biology. 45 (3): 426–37. doi:10.1093/icb/45.3.426. PMID 21676788. ↑ Gabriel, W. 2005. How stress selects for reversible phenotypic plasticity. Journal of Evolutionary Biology 18:873–883. ↑ Garland, Jr., T., and S. A. Kelly. 2006. Phenotypic plasticity and experimental evolution. Journal of Experimental Biology 209:2344–2361. ↑ De Jong, Gerdien (2005). "Evolution of phenotypic plasticity: Patterns of plasticity and the emergence of ecotypes". New Phytologist. 166 (1): 101–17. doi:10.1111/j.1469-8137.2005.01322.x. PMID 15760355. ↑ Langerhans, R. Brian; DeWit, Thomas J. (2002). "Plasticity constrained: Over-generalized induction cues cause maladaptive phenotypes". Evolutionary Ecology Research. 4 (6): 857–70. ↑ Dewitt, Thomas J.; Sih, Andrew; Wilson, David Sloan (1998). "Costs and limits of phenotypic plasticity". Trends in Ecology & Evolution. 13 (2): 77–81. doi:10.1016/S0169-5347(97)01274-3. PMID 21238209. ↑ Janzen, Daniel H. (1967). "Why Mountain Passes are Higher in the Tropics". The American Naturalist. 101 (919): 233–49. doi:10.1086/282487. ↑ Naya, Daniel E.; Bozinovic, Francisco; Karasov, William H. (2008). "Latitudinal Trends in Digestive Flexibility: Testing the Climatic Variability Hypothesis with Data on the Intestinal Length of Rodents". The American Naturalist. 172 (4): E122–34. doi:10.1086/590957. JSTOR 590957. PMID 18717635. ↑ Molina-Montenegro, Marco A.; Naya, Daniel E. (2012). Seebacher, Frank, ed. "Latitudinal Patterns in Phenotypic Plasticity and Fitness-Related Traits: Assessing the Climatic Variability Hypothesis (CVH) with an Invasive Plant Species". PLoS ONE. 7 (10): e47620. doi:10.1371/journal.pone.0047620. PMC 3478289 . PMID 23110083. ↑ Overgaard, Johannes; Kristensen, Torsten N.; Mitchell, Katherine A.; Hoffmann, Ary A. (2011). "Thermal Tolerance in Widespread and TropicalDrosophilaSpecies: Does Phenotypic Plasticity Increase with Latitude?". The American Naturalist. 178: S80–96. doi:10.1086/661780. PMID 21956094. ↑ Clements, Forrest E. (1928). "The End of a World by Claude Anet". American Anthropologist. 30 (1): 125. doi:10.1525/aa.1928.30.1.02a00120. JSTOR 660970. ↑ Maldonado, Karin; Bozinovic, Francisco; Rojas, José M.; Sabat, Pablo (2011). "Within-Species Digestive Tract Flexibility in Rufous-Collared Sparrows and the Climatic Variability Hypothesis". Physiological and Biochemical Zoology. 84 (4): 377–84. doi:10.1086/660970. PMID 21743251. ↑ Williams, Stephen E.; Shoo, Luke P.; Isaac, Joanne L.; Hoffmann, Ary A.; Langham, Gary (2008). Moritz, Craig, ed. "Towards an Integrated Framework for Assessing the Vulnerability of Species to Climate Change". PLoS Biology. 6 (12): 2621–6. doi:10.1371/journal.pbio.0060325. PMC 2605927 . PMID 19108608. ↑ Réale, Denis; McAdam, Andrew G.; Boutin, Stan; Berteaux, Dominique (2003). "Genetic and plastic responses of a northern mammal to climate change". Proceedings of the Royal Society B: Biological Sciences. 270 (1515): 591–6. doi:10.1098/rspb.2002.2224. JSTOR 3558706. PMC 1691280 . PMID 12769458. Mary Jane West-Eberhard (2003). Developmental Plasticity and Evolution. Oxford University Press. ISBN 0-19-512234-8. Theunis Piersma, Jan A. Van Gils (2011). The Flexible Phenotype: A Body-Centred Integration of Ecology, Physiology, and Behaviour. Oxford University Press. ISBN 978-0-19-164015-5. See also: Garland, Theodore (2011). "The Flexible Phenotype: A Body-Centred Integration of Ecology, Physiology, and Behaviour". Animal Behaviour. 82 (3): 609–10. doi:10.1016/j.anbehav.2011.06.012. Wikimedia Commons has media related to Phenotypic plasticity.